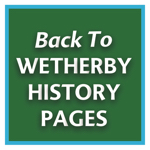 The original Wharfedale Brewery was founded in Wetherby in 1756 by brewer, malster and farmer John Rhodes. When John Rhodes died in 1780 he was succeeded in the brewery by his eldest son Gregory and his second son Quentin and the two of them guided the fortunes of the brewery well into the nineteenth century. Quentin Rhodes, an important local businessman, made his fortune selling beer to many of the town’s 15 pubs. 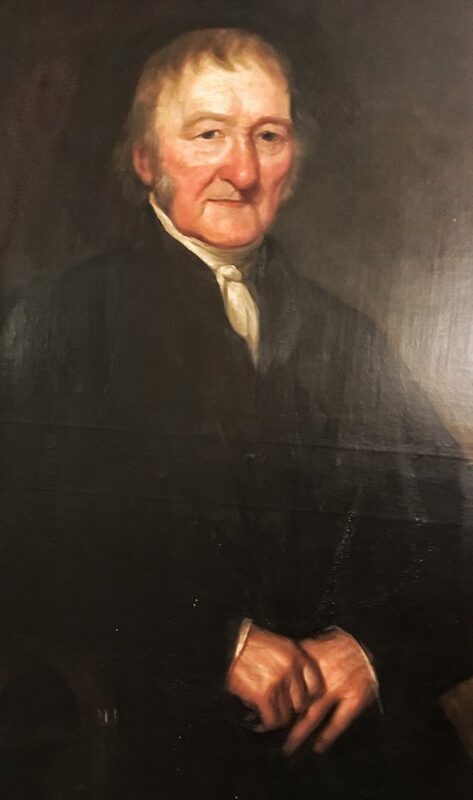 His portrait above still hangs in Wetherby Town Hall. 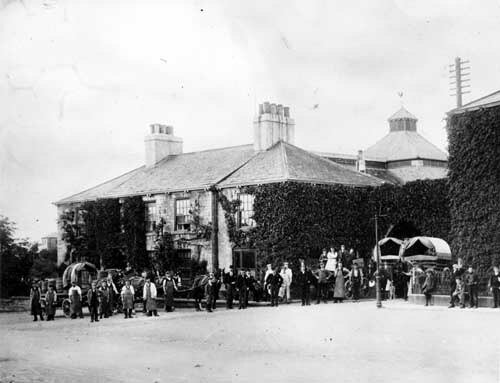 In 1892 the brewery was sold by Rhodes’ nephew Mr. Coates, solicitor and clerk to the Board of Guardians, and became known as Braime’s Brewery, which was first registered in Tadcaster 1895 and later merged with the Wharfedale Brewery in 1899. In the 1870’s Benjamin Braime started a small brewery next to the site which had been acquired by John Smith. Braime then sold his High Street brewery to John Smith’s. 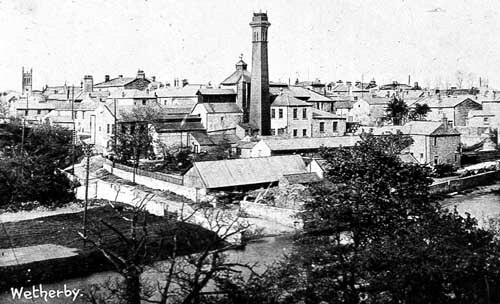 View of Wetherby from the south of the River Wharfe, showing the building and chimney of Wharfedale Brewery (the chimney was demolished in 1937). The tower of St. James’s Church can be seen in the background,left and the River Wharfe cuts across the foreground. Braime’s Brewery then continued in Maltkin Square until 1906 when it went bankrupt. 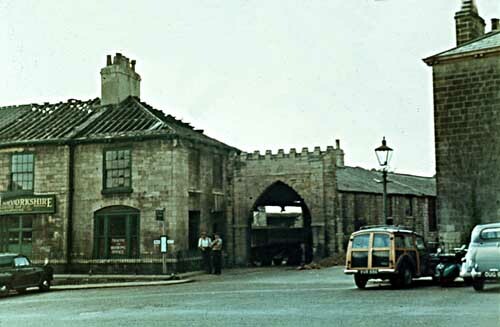 These premises later became John Smith’s bottling store. 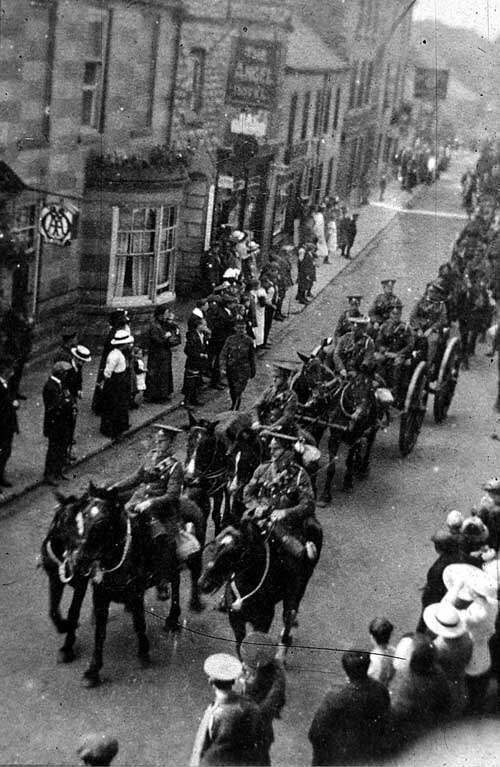 Parade down Wetherby High Street by the Coal Owners 155 West Riding Royal Field Brigade of Artillery, who were billeted in the Wharfedale Brewery during World War I. Visible in the background is the Angel Inn. The street is lined with people in period dress and it is recorded that the town council agreed to loan them the town band’s instruments. The photograph is taken looking south. The brewery closed during the First World War and later became Oxley’s Mineral Water factory in the inter-war years. 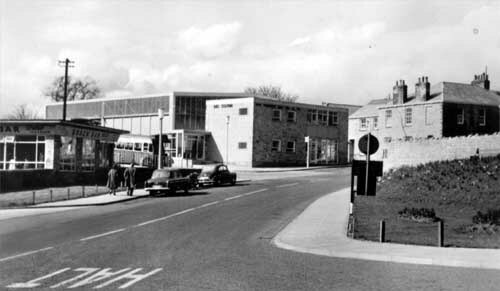 In the 1950s the building, located in the town’s market square, was demolished and replaced by a new bus station and depot. The name was resurrected in 2003 further up the River Wharfe in Grassington, by Steve Blizzard and David Aynesworth, (owner of the Craven Arms in Appletreewick and star of YTVs “Yorkshire’s Perfect Pint”). They produced a number of fine beers, which could be found on the bars of pubs throughout the Yorkshire Dales, under the “Folly Ales” brand. The company was dissolved for personal reasons in 2007. In late 2012, a group of friends and real ale enthusiasts came up with the idea of a brew Pub back down stream in Ilkley. In March 2013 they took over the lease of the former Albert Inn on Church street. The pub, which was built in 1709 as a farmhouse, was renamed the Flying Duck and following extensive refurbishment opened in the summer of 2013. In a barn at the back of the Grade II listed building, Wharfedale Brewery was brought back to life once more and resulted in brewing returning to Ilkley town centre for the first time in well over 100 years. The new brewery, which predominantly serves the pub, a small number of carefully selected local hostelries and local beer festivals, produces three core beers; Wharfedale Blonde, Black and Best Bitter, seasonal specials and bottled beers.